I have a close friend who is over 50 years old. He is smart, professional and works hard to stay up-to-date on the latest developments in his field. My friend worked for the same organization for more than 25 years. However, in 2014, during a reorganization, he was “offered” a package without the option to decline. In plain language, my friend was fired. He later learned that his position was given to someone half his age, with far less experience. It took my friend more than four years to find another job. This week, I read that the University of Wisconsin refused to hire a former longtime employee because of her age, despite her many years of experience, knowledge of the job and long career with the university. Instead, the University of Wisconsin gave the job to a 23 year old with less than two years of work experience. There are many types of discrimination we can experience in the workplace. However, according to the United States Equal Employment Opportunity Commission (EEOC), the 12 most common discrimination types are age, disability, nationality, gender, race, religion, retaliation, sexual orientation, pregnancy, harassments, equal right to compensation and genetic information. This article is focused on age discrimination. Age discrimination is something the average worker in the United States is seeing more frequently. Sometimes, it becomes a vicious cycle without a specific start or finish point. Unfortunately, while research shows that people over 40 are at risk of experiencing some form of age discrimination in the workplace, age discrimination can affect anyone. With age discrimination also comes bias, profiling, stereotyping and other inequality issues. It is therefore important we keep ourselves informed when it comes to age discrimination in the workplace. First, we need to learn about the Age Discrimination in Employment Act of 1967. The Act protects employees 40 years of age and older from discrimination on the basis of age in hiring, promotion, discharge, compensation or terms, conditions or privileges of employment. The Act protects older workers who find themselves at a disadvantage to retain employment because of the organizational cost that it represents for the company. The Act also helps older people to re-gain employment when they have been displaced from jobs and protects older employees from the monetary disadvantages that their experiences and expertise might represent. To either refuse to hire or to discharge an individual because of the compensation, privilege of employment, and or other environment conditions associated with age. To limit workplace environments with the intentional purpose of depriving employment, development, and growth opportunities to a particular social group within an age range standard. To reduce employment wage salary because the person is belonging a specific age group. Research has shown that there are places where age discrimination is profound and visibly applied, as for example, in recruitment. When a person over 40 has been unemployed, even for a relatively short amount of time, this person will be faced with the difficulties and particularity of age when trying to rejoin the workforce. In 2014, Judith Davey, a Senior Associate of the Institute for Governance and Policy Studies and former Director of the New Zealand Institute for Research on Ageing reported that age discrimination in the workplace is paired with the tendency of stereotyping and generalization to implement specific human resources practices. Other disadvantages of age in the workplace that Davey found in her research include merit assessments, seniority renumeration practices, social and corporate preferences for younger staff, and a tendency for younger managers to recruit people like themselves. 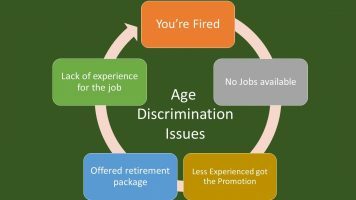 Research has also shown that some other issues related to age discrimination in the workplace are associated with continuing education, training, promotions, isolation, limitation of job responsibilities, premature retirement offers and more, which will intensify depending on the individual’s professional field. Although not all discriminatory practices in the workplace are related to age, the EEOC established that, even when employment policies can be applied to everyone in the organization equally, if the policy has a negative impact on its application, when applied to a person over the age of 40, the policy in question might be illegal. My advice is that, to protect ourselves from age discrimination practices in the workplace, we first must learn the organizational and governmental policies that protect us against it.